Coffee plant, Coffea arabica, is the source of the beans that make the widely consumed beverage. Fragrant white flowers and shiny green foliage make for a handsome indoor plant in cooler climates. 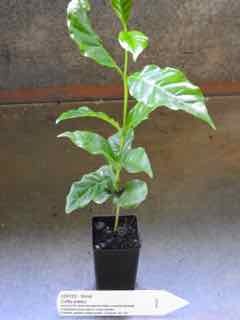 Coffee plant is native to Ethiopia and prefers deep, rich soils in a protected, partially shaded position. Drought and frost tender. An evergreen shrub, growing to 3m x 2m. Different sizes, see Description for size currently available.